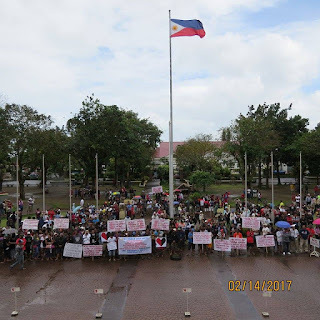 DAET, Camarines Norte 2/14/17 (Bicol Standard)--Close to 5,000 small-scale miners flocked to the Provincial Capitol to protest the Cease and Desist Order issued by the DENR against gold panners in the towns of Labo, Jose Panganiban, and Paracale. Headed by Serafin Dasco, the group went on hunger strike for the entire day. According to Dasco, the government should recognize the small-scale miners sector. They are also seeking for the approval of the permit for the Minahang Bayan. The group was invited to air their gripes before the officials of the DENR in the Office of the Sangguniang Panlalawigan.